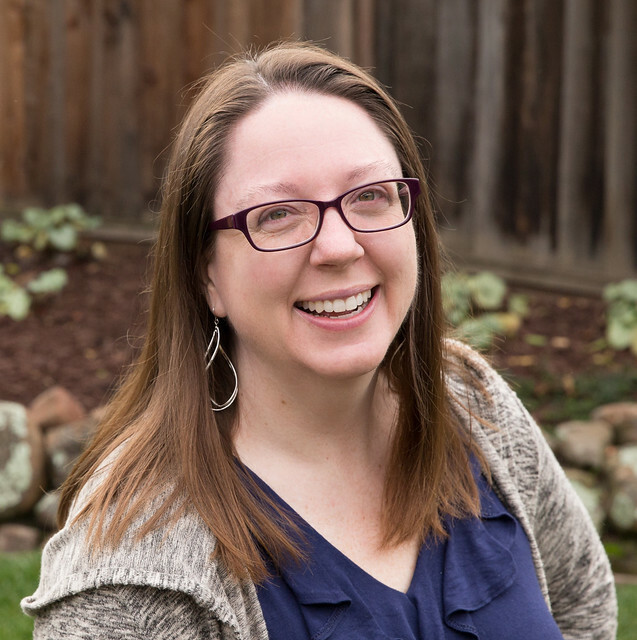 My quick and easy idea came from a breakfast potluck we hosted recently with friends. Someone brought Starbucks coffee, but we used actual coffee mugs. When I was cleaning up after breakfast I tossed the pile of unused Starbucks paper cups into the bin of art supplies. Then I decided that they would make a really cute little gift basket container. I had a couple partially used Starbucks gift cards, so the kids and I made a quick stop at Starbucks to purchase $5 gift cards for each teacher, which only cost me a few bucks overall. (I'm not a coffee drinker, so I'd had my gift cards for years.) 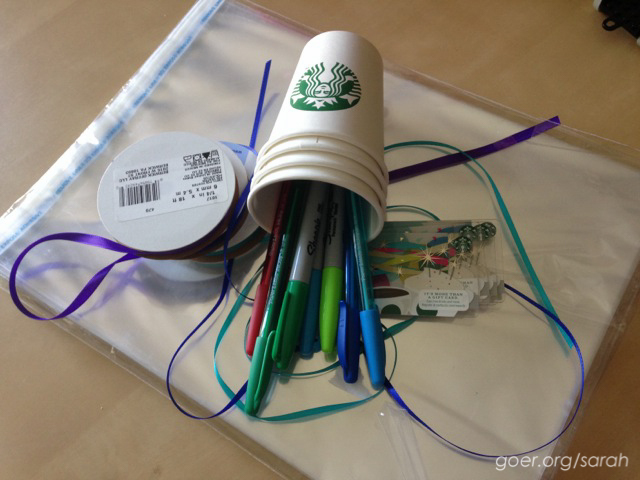 When I shopped for school supplies I picked up colorful packs of sharpies and ball point pens, so we could put a sharpie and a pen in each gift cup. 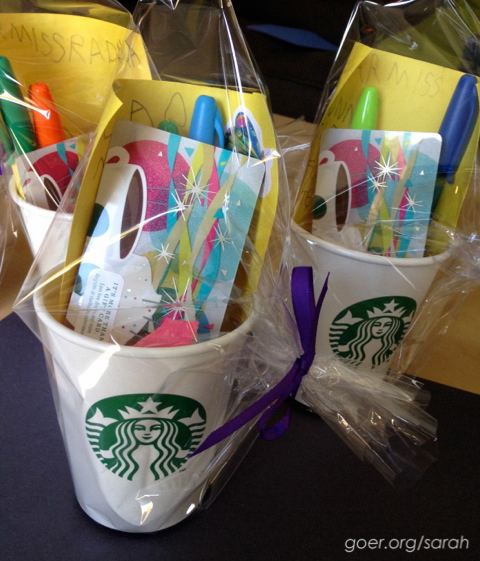 The Boy wrote each of his teachers a little note and helped me put together these little gift cups. He wadded up a piece of construction paper in the bottom of the cup to help stop stuff from flopping around. We used leftover cello bags from birthday party favors to wrap them. I love how tying them on the side kinda gave them the look of having a handle like a coffee mug. The Boy signed them with a heart and his name. Posted in Kid Stuff. 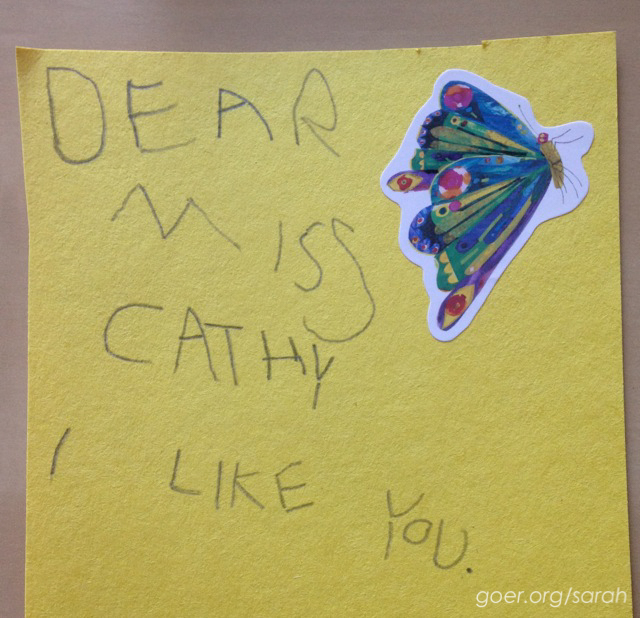 Tags: teacher gifts on August 27, 2014 by sarah. What a wonderful and thoughtful idea! Thank you. He has the same teachers as last year in preschool and was so excited to get back to them. It was fun to do something special and he was so excited to put the gifts together. Such a thoughtful gift and much appreciated!